It's fitting that the very first entry in this blog is this "NFS" poster at the Jim Kempner gallery. Not for sale? Hard to believe, with the plethora of Obamabilia making profits of bailout proportions for the memento magnates. Yes, I'd have parted with $2.50 - maybe even $3, for a postcard of this image, but alas, it was just "something the publisher put together," according to the gallery attendant. 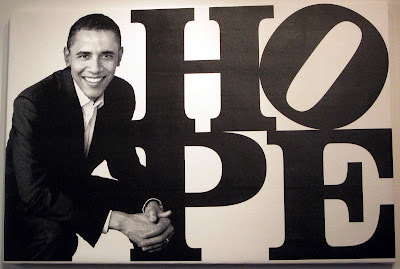 For the uninitiated, HOPE is based on the famous LOVE poster and sculpture by famous pop artist Robert Indiana. Indiana donated all the proceeds of HOPE to the Obama campaign, raising more than $500,000. No wonder he won! I found myself dreaming of owning a LOVE/HOPE salt 'n' pepper set then slapped myself to regain my usual intolerance for contrived memorabilia.